The third installment of the ‘Planet of the Apes’ reboot series finds the genetically enhanced apes lead by Caesar (Andy Serkis) in a war for survival with the last of the surviving humans. Apes and humans find themselves unable to coexist in the events of the last film and now both sides struggle to become the dominate species with Apes seeking peaceful lives and humans wanting their extinction. The film is a technical marvel that creates a solid trilogy that pleases both fans of the reboot series and original with references and faithfulness to the first five films. War for the Planet of the Apes is thrilling and satisfying with the motion-capture for the apes being unbelievably realistic that you no longer see them as special effects but instead three-dimensional characters. Every performance from both apes and humans hit the mark with Andy Serkis portraying an older Caesar on the verge of losing himself at the high cost of war and Woody Harrelson as The Colonel, the leader of the human army who has a “no price too high” mentality of saving humanity’s position at the top. Both Caesar and The Colonel represent their side of the conflict in the final standoff of apes vs. humans—only not so much. Evolution of the apes’ special effects. Comparing both Caesars from the original series and the reboot; Roddy McDowall (left) in practical makeup and costume from Conquest of the Planet of the Apes next to Andy Serkis (right) in full CGI with motion capture. War for the Planet of the Apes isn’t so much a “war” but really an opening battle that has stellar action with apes using primitive tools and less-modern weaponry against equipped soldiers in jungle warfare. The film is really about the apes looking to escape the conflict (too bad Escape from the Planet of the Apes was already taken) and reach a new home away from human interference but events and unexpected actions lead Caesar to go after The Colonel. Caesar, still haunted by the ghost of the treacherous and human-hating Koba, is tested when the war hits close to home and he struggles to keep to his morals or act out in vengeance. 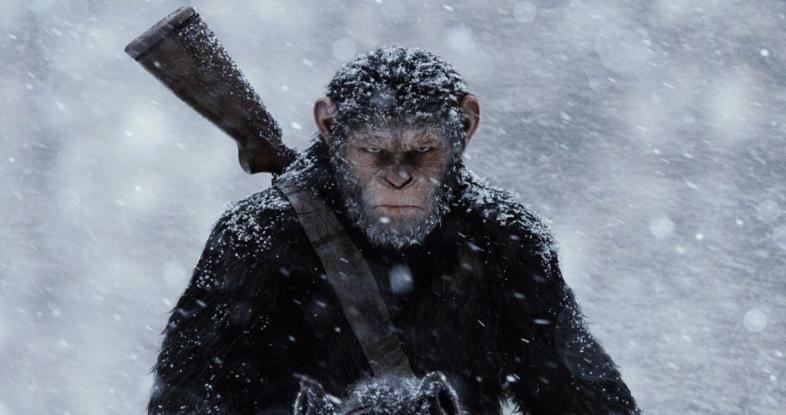 Despite the film leaning towards Caesar becoming like Koba and not being able to let go of his rage even when it puts the lives of his apes in jeopardy, the film cheats to give the apes the moral high ground while still removing oppositions. The narrative has become “Apes good, humans bad.” as the apes become the victims to human cruelty with the only redemption being a mysterious young girl who has an affliction; other than that, there seems to be more humanity with the apes rather than the humans. The apes merely try to survive as humans self-destruct in the overall conflict; the film decides to portray the apes as benevolent and a strong, united family that has the situation work out for them instead of cornered animals that instinctively try to survive no matter what, choosing between surviving or doing what’s right. It would have added a much more interesting dynamic to the apes instead of following Caesar without question, but at this point he has more than earned the apes trust to follow his lead. A few plot elements could have been added as not to have such an obvious good side versus bad side—portraying both sides as just wanting to avoid extinction and having a “it’s them or us” way of driving their actions would have been more understanding, especially in times of war. Andy Serkis has made a career of portraying full CGI characters using motion capture with his most noticeable work being Supreme Leader Snoke in Star Wars (left), Gollum in Lord of the Rings (center), and the titular King Kong in the 2005 Peter Jackson version(right). Serkis has received acclaim for his performances and is still best in his field with his amazing portrayal of Caesar. The film makes wonderful additions to the series such as Bad Ape, a chimpanzee who serves as most of the comedic relief, as well as The Colonel, but I’m a bit more surprised with what the film leaves out. Established characters and newcomers have less screen time than expected, mostly to serve as ways to drive the conflict, to become a plot device, or just to be there in the background. It was personally a bit disappointing when some of the more interesting apes were sidelined to make way for Caesar’s conflict with The Colonel, especially when these apes weren’t given a lot of screen time in the previous films to begin with. However, the focused remained on Caesar and the story revolving around him more than makes up for any shortcoming; after three films, the viewer sees the evolution of his character from small beginnings to metaphorical ape Moses. Andy Serkis gives a hundred percent and cements Caesar as the best Planet of the Apes character in the franchise’s history; his performance takes a wide range of emotional highs and lows with ferocious, strong leader and broken, helpless animal. Despite my gripes with themes and a few characters, the film is spectacular with incredible performances all around, the action scenes were intense and gave real consequences for every explosion, gunshot, and fight. The apes, regardless of being all CGI, never once took me out of the experience because it looked fake; they always seemed to be physically in the scene. The movie excels because great attention was given to it; it’s uniquely its own story rather than just a retread of the previous entrees but still stays true to the overall franchise. It’s without a doubt a great conclusion to the series and now the best trilogy since The Dark Knight trilogy.